Someone was out to get Tunsil, and succeeded. We don’t know who that someone is. But we know someone’s been trying to sell that video for weeks. 40 sec video of Projected top 5 pick in the 2016 NFL draft smoking drugs (crack or weed) from gas mask. Looking to sell. They then sent three screen shots from the video that emerged last night. We did nothing after that. We will pay for a good story (email us! ), but a college kid smoking weed is not a story at all. A day later, after we had not responded to the emailer, they tried one more time. We didn’t reply, and that’s the last we heard from them. Suspicion for the hacks quickly and naturally fell upon Tunsil’s stepfather, Lindsey Miller, with whom Tunsil has been engaged in a lengthy and nasty legal battle. Last June, Tunsil was arrested on domestic-violence charges after a fight with Miller. Tunsil told police that his stepfather had pushed his mother, and he punched Miller to protect her, and pressed charges against Miller. Miller told police that Tunsil hit him at least six times, that the attack was unprovoked, and that the argument started over Tunsil having impermissible contact with agents. NCAA investigators interviewed Miller over his claims that he had proof of rules violations committed by Ole Miss. A month later, Tunsil and Miller agreed to drop the charges against each other. Immediately after being drafted at No. 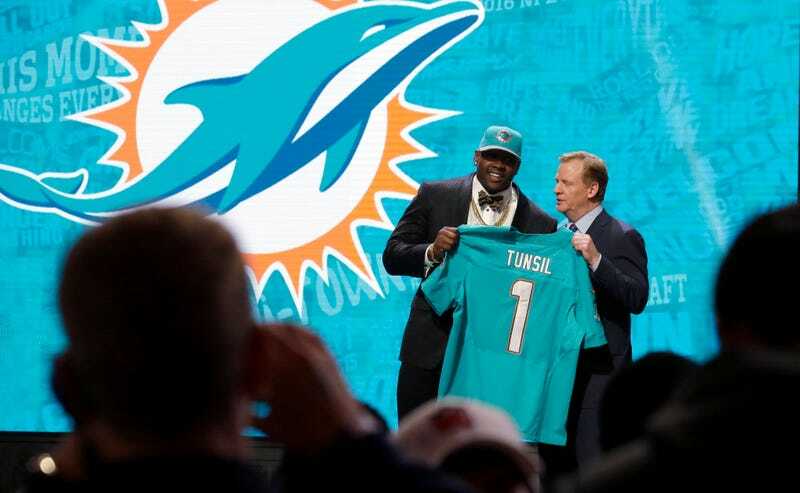 13 by the Dolphins, Tunsil was asked if he believed his stepfather was behind the Twitter hack and the release of the video, which he said was years old. “I don’t know who it was,” Tunsil said. The war-room panic over Tunsil might be the best example of the NFL’s disconnect from society. A college kid smoked marijuana. That’s it. And yet that was enough for so many teams to decide they didn’t want to risk drafting the guy most had as the most talented offensive tackle available. The Ravens—the Ravens, for god’s sake!—were scared off by weed. The Drug Value Guy is regularly the single biggest market inefficiency in the NFL, and it seems that everybody but the people in charge realizes it. For more than an hour last night, the draft was the center of a bizarre mental tug-of-war between teams on the clock and their supporters. You had fans praying that their teams would select Tunsil, and then team after team passing because weed is bad. Tyrann Mathieu, Randy Moss, Warren Sapp, Dan Marino: all players whose draft stock suffered because of drugs, all incredible bargains for the teams that selected them. We don’t know what Tunsil’s career will look like—nor Robert Nkemdiche’s—but their skills are so highly regarded that their new teams would never have been able to get them if not for the NFL’s strange, retrograde attitude toward recreational drugs. Tunsil had the exact right attitude toward everything. There was no overwrought apology, no big production of saying he’s a changed man. In interviews, he projected a man mildly embarrassed only because social conventions indicate he ought to be, but did not pretend like smoking weed was actually a big deal, or anything to feel genuinely remorseful for. Because it’s not. The only regrets from draft night ought to be from Tunsil for his poor password hygiene, and from a whole bunch of early-drafting NFL teams for passing on a top prospect for the absolute dumbest of reasons. And whether they regret it or not, the biggest shame belongs to whichever dirtbag screwed over Tunsil.